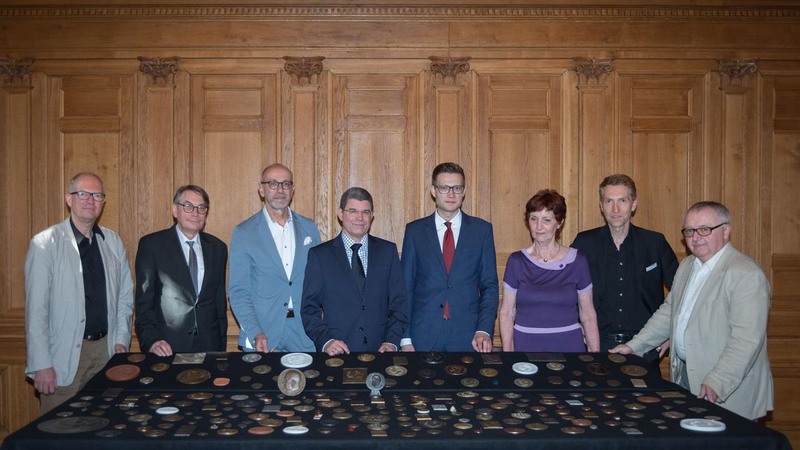 On 19 September 2018, the Leipzig University Library first presented its 218 newly-acquired collection of medals made by Bruno Eyermann (1888-1961) to the public. Eyermann was the central figure among Leipzig’s artistic medalists in the first half of the 20th century. Thanks to generous third-party funds, the library was able to purchase the extensive collection. After his studies at the Leipzig Academy of Fine Arts, Bruno Eyermann started working there as a lecturer in 1919. In 1923, he started a rich production of medals as an independent artist, characterized by its exceptionally firm and realistic graphic style, which, with its orientation towards Classical Modernism and New Objectivity, went on to significantly influence even the German Democratic Republic’s medal art. Another typical feature is his experiment with different formats and materials. Eyermann seems to have always avoided coming too close to the different political systems he experienced. Starting in October, the collection will be publicly presented as part of a new exhibition at the library: “GELDKULTURERBE. 300 Jahre Münzsammlung der UB Leipzig” on occasion of the 300th anniversary of the library’s coin collection, from 5 October 2018 until 1 January 2019. A catalog of the same name will be published at the exhibition’s opening on 4 October. It was the collaboration of several sponsors that enabled the library to purchase the collection: the Kulturstiftung der Länder[Cultural Foundation of the German Federal States], the Ostdeutsche Sparkassenstiftung[East-German Savings Bank Foundation] together with the SparkasseLeipzig, the Fritz Rudolf Künker GmbH & Co. KG Osnabrück as well as the Verband der Deutschen Münzenhändler e. V. [Association of German Coin Dealers]. On occasion of the 300-year anniversary of the coin collection in 2018, they not only gave the Leipzig University Library an amazing birthday gift, but also set an important basis for future scientific work on Leipzig’s artistic medals. “The Ostdeutsche Sparkassenstiftung and theSparkasse Leipzighave been partners of the University of Leipzig for years. We are happy to be able to help once again and sponsor the Eyermann collection’s purchase. Leipzig and its university library are gaining a treasure. Handicraft, art and history are wonderfully combined in this. We are looking forward to the exhibition starting in October. Our tip: Make sure to visit, look at the exhibits and let yourselves be amazed”, Andreas Koch from SparkasseLeipzig and Alexander Salomon from the Ostdeutsche Sparkassenstiftung saidat the presentation.